Paxton 1992-1996 Viper RT/10 System Polished Finish [1201830-P] : Supercharger Superstore, Your Online Source for Vortech Superchargers, Paxton Superchargers, Procharger Superchargers, Magnacharger Superchargers and Techco Superchargers! 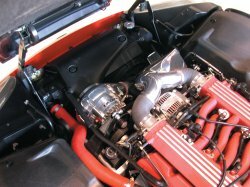 With an increase of up to 163 horsepower, Paxton's Dodge Viper GTS supercharging system is the ultimate for the street in a bolt-on package. From the legendary NOVI 2000 gear-driven centrifugal supercharger to the integrated air-to-water, dual pass charge cooler you'll have power on demand at any time. It's easy to see why Paxton has been a supercharging tradition spanning more than four decades.